Home » Annetarsia Knits » A chance to be a student? I’ll take it! I love teaching, I really do: Meeting new people, sharing what I love, taking every teaching opportunity as a chance to improve the class experience for knitters. I am very, very lucky to have the chance to participate in events as a teacher, and I appreciate it very much. BUT, teaching every session means that there is no time to take a class, yourself! My friend Daniel Yuhas is a talented knitter, designer and teacher, who consciously takes the time to go to events as a student. Author of Knitting from the Center Out, he is, of course a big fan of Norah Gaughan, who does amazing designs with shaping in unusual directions. She is teaching Geometric Knitting Design at the Columbia Gorge Fiber Festival next weekend, and he signed up for the class. Then a family trip came up for that weekend, and he offered me his spot. Now, this type of knitting is not in my design wheelhouse. 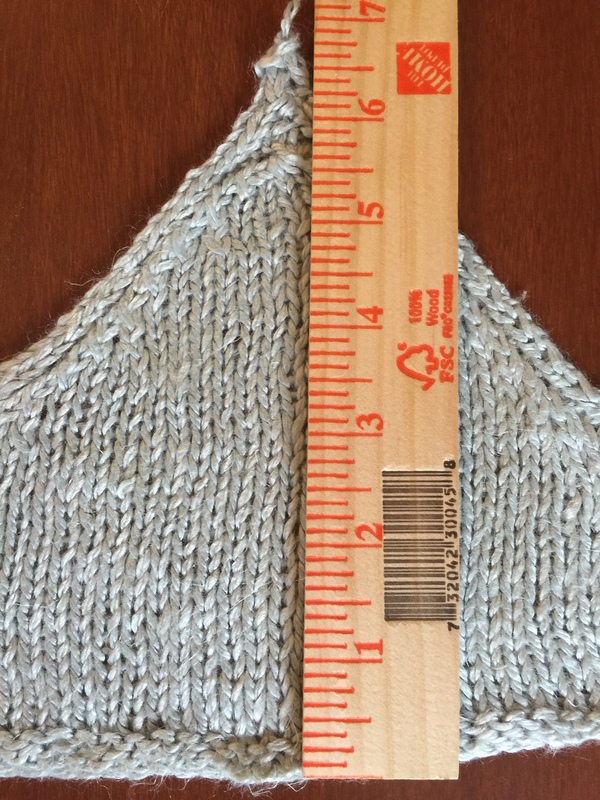 I knit patterns other people design, but Annetarsia designs are very simple shapes, letting the colorwork be the star. I’ve never thought about designing Annetarsia into geometric shapes, but it might be fun and fabulous. As soon as I said I wanted to take the class, I got really excited and wanted to start knitting right away. In my stash, I found enough Plymouth Sahara to make Atomium, which should be great in this 40%linen/40%bamboo/20%silk blend. The first step in the pattern is to knit several large triangles, which is pretty convenient for swatching! 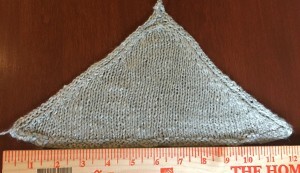 My first triangle was spot-on for both row and stitch gauge. SCORE. 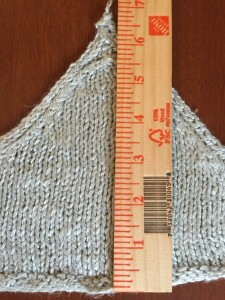 On gauge – piece measures 12″ across. My friend Karen Campbell sent me a supply of one of my favorite yarns, Simply Shetland silk&lambswool, in a fabulous icy blue/gray. 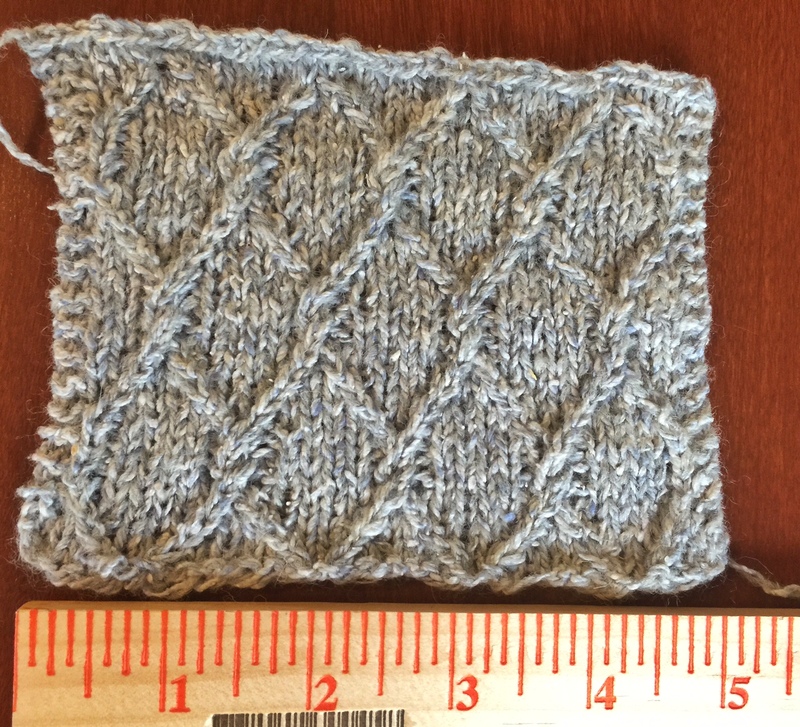 I immediately thought of Norah’s Chainlink sweater, and knit a swatch which provided correct gauge. But the shape of this sweater is REALLY different, and I was nervous about how it would look on me. Now, I will get a chance to quiz Norah, herself, and get her input on how it might actually look on my figure. 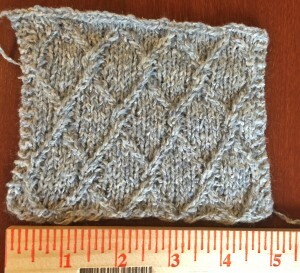 Swatching for “Chainmail” sweater. 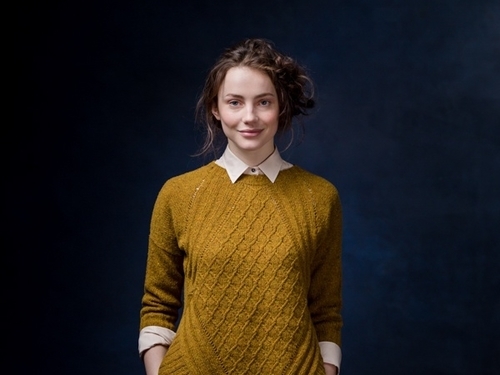 Yarn is Simply Shetland silk & lambswool, in Shade 001. I love it… lightweight and soft, but strong. Being a student is one of the best things a teacher can do, as it reminds us of what it is like to be on that side of a classroom. I am looking forward to the class, and will be knitting Atomium this week, in anticipation! I am taking a few months off from teaching, to rejuvenate and do things like take Norah’s class that will inspire me to go in new directions, and will help me be a better teacher. I might even do some Annetarsia designing in a geometric shape or two. There is no creativity without play. I say this in every class, and now I am going to take my own advice! This spring I will be teaching all over the place, from Washington State (Madrona Fiber Arts), California (Stitches West) and Tennessee (Stitches South). Check out these events – I’d love to see you there!